(top) Rattlesnake on the $20 bill issued in 1778 by Georgia. "No one will provoke me with impunity." first published in the Pennsylvania Gazette in 1754. Normally when someone asks me how to tell the difference between a snake and a legless lizard, I tell them to look at the eyes. 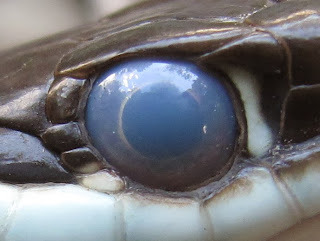 Lizards have eyelids whereas snakes do not. Whenever I say this I am lying, although really I am just oversimplifying for the sake of clarity. Most lizards have obvious movable eyelids and so can blink like we do. Snakes, by contrast, seem not to have eyelids. They are ever-staring, ever-vigilant. 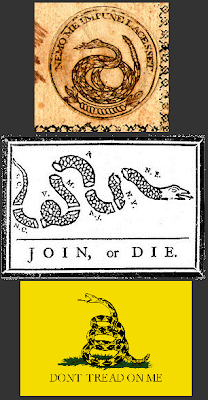 Ben Franklin esteemed the rattlesnake as a symbol of vigilance because its eyes were always open. Snakes' eyes are closed all the time. Rather than having movable eyelids, snakes have a single, fused, clear layer of skin over their eye, called a spectacle or brille (German for "glasses"), which protects the eye. A snake's skin is covered in scales, and the outer part of the spectacle is indeed a scale. The deeper layers of the spectacle are formed, during development, from the same embryonic tissue that in other animals forms the eyelid. The spectacle is not attached to the snake's eye in any way, so the eye can move freely behind it, although its movement is limited. This limited movement is because snakes are probably descended from fossorial lizard ancestors that lived underground and had degenerate eyes, much like today's amphisbaenians, although fossil evidence for this hypothesis is scant (as are snake fossils in general). 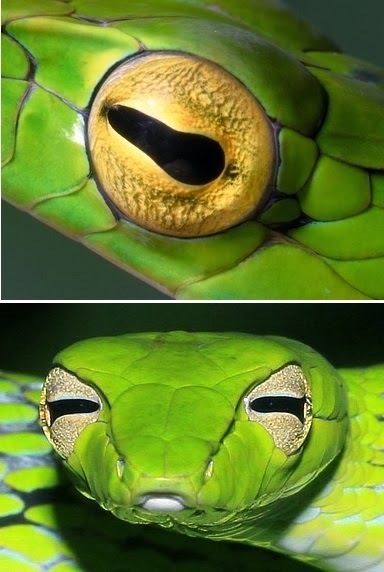 Unlike other animals' eyelids, snakes' spectacles are transparent, like a window in their skin, allowing them to see out through their always-closed eyelids. 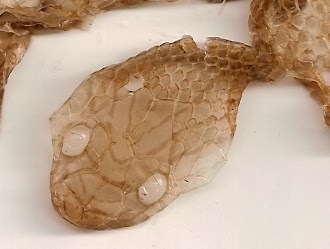 Just before a snake sheds its skin, a layer of fluid builds up between the new inner skin and the old outer layer, clouding the spectacle and causing the other scales to have a faded, milky appearance. This period usually lasts a few days, during which snakes have difficulty seeing and usually will not eat. People who keep snakes as pets have observed that they may become particularly ornery during this period, perhaps as a result of not being able to see clearly. Another obstacle to snake vision that has been long known but little studied is that snakes' spectacles are vascularized, meaning that they have blood vessels running through them. It is very unusual for tetrapods to have blood vessels in a place that might interrupt their field of vision. First noticed in 1852, these vessels are small but symmetrically distributed across the optically transmissive region of the eye in most species, although the arrangement is radial in basal snakes, acrochordids, and vipers but vertical in colubrids and elapids. In one visually-oriented species, the Asian vine snake (Ahaetulla nasuta), these blood vessels are less dense in the region of the field of vision known as the fovea, where the maximum sharpness is achieved. Most snakes don't have foveas, suggesting that the unusual arrangement of blood vessels in the eyes of Ahaetulla is an adaptation to minimize visual disturbance in this region of highest visual acuity. Until recently, no one had considered whether movement of blood into and out of the spectacle blood vessels might aid snakes in being able to see. 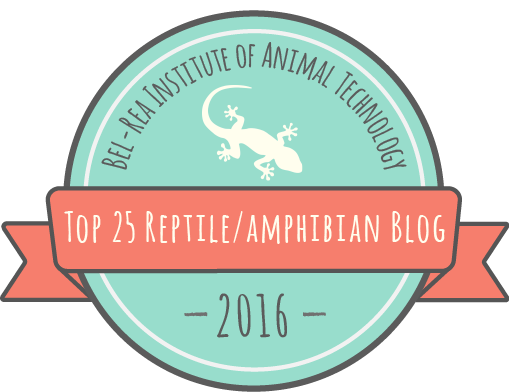 In an article published this week in The Journal of Experimental Biology, Kevin van Doorn and Jacob Sivak of the University of Waterloo in Ontario presented the first evidence that snakes are able to do this. When van Doorn was investigating the mechanisms snakes' eyes use to focus, he noticed the blood vessels in the spectacle, which led him to look more closely at their function. He found that coachwhips, another highly visual species, were able to reduce blood flow to the spectacle in the presence of a potential threat. At rest and undisturbed, newly oxygenated blood flowed into the spectacle blood vessels of the coachwhips for about a minute at a time, interspersed with approximately two minute periods during which no flow took place. When an experimenter walked into the room to perform some routine tasks, spectacle blood flow was almost completely cut off. What little flow there was during this period occurred in short spurts of around 30 seconds each, about half the length of the flow period in undisturbed coachwhips. When the experimenter left the room, the pattern of blood flow in the snakes' eyes returned to normal almost immediately. Figure from van Doorn & Sivak 2013 showing blood vessels in the spectacle of a Coachwhip (Masticophis flagellum). (A) Image taken during the renewal phase of the integument when the spectacle becomes cloudy. The vessels are most apparent in the region that overlays the iris–pupil boundary because of their higher contrast with the background in this region. (B) The spectacle under retro-illumination, showing the vessels in the illuminated anterior portion of the pupil on the right side. The vessels are dorso-ventrally arranged as is typical for colubrid snakes. Debris and scratches are visible on the spectacle scale (particularly the left side), attesting to its protective role. Furthermore, van Doorn & Sivak found that when snakes were handled they cut off blood flow to the spectacle completely, probably as part of a sympathetic nervous response. In contrast, blood flow to the eye was continuous and uninterrupted, even during handing, in shedding snakes. You can see a video of blood flow in the spectacle of a shedding corn snake here. Although no experimental evidence has been gathered that filled blood vessels in the spectacle reduce a snake's ability to see, it seems likely given that the blood vessels themselves are quite difficult to see when they are not filled with blood. Snakes actually have remarkably good color vision, better than that of rats and on par with the visual acuity of a cat. Because they move their eyes so little compared to humans, they might be less likely to notice the interruption to their visual field by these blood vessels. Geckos and some other lizards also have spectacles. A few other species of tetrapods have blood vessels in their optical path, including manatees, armadillos, and some blind salamanders, none of which are renowned for their visual prowess. Little is known about the images these vessels might project onto the vision of these animals, but because they are part of the cornea and so move about with the eye rather than remain stationary relative to it, their area of occlusion would appear to remain stationary to the animal. This is not true for animals with nictitating membranes (diving animals such as penguins or crocodilians) or those with spectacles, both of which have the potential to interrupt the animal's vision. We don't know yet how crocodilians and geckos deal with this issue, but as with so many other features of their lives, snakes have evolved an ingenious and potentially unique solution to a vexing problem, allowing them to remain vigilant as well as keep their eyes protected. Snakes have guarded the Golden Fleece in the Greek tale of the hero Jason and his band of Argonauts, a treasure chamber beneath an ancient city in Rudyard Kipling’s The Jungle Book, and various other treasures in Hindu, Inca, and Basque mythology, all with their eyes closed. Thanks to Hans Breuer and Kwok Wai for their photographs of Ahaetulla prasina. Correction: I originally said that the fovea work was done on Ahaetulla prasina, but it was actually Ahaetulla nasuta. Both species have horizontal pupils so it is likely that the reduction in blood vessels is found in both. Crump, M. Expected 2015. Eye of Newt and Toe of Frog, Adder's Fork and Lizard's Leg. University of Chicago Press, Chicago, Illinois. Lüdicke M, 1969. Die kapillarnetze der brille, der iris, des glaskörpers und der chorioidea des auges vom baumschnüffler Ahaetulla nasuta Lacepede 1789 (Serpentes, Colubridae). Zoomorphology 64:373-390.